Forget the Middle East; there is an ongoing war right here in the walls and halls of Bonny Eagle High School between the students and the chairs upon which they sit. The growing conflict has claimed many innocent chairs by forcing them to succumb to great strains, stresses, and contortions. It is unclear whether the conflict has been driven by student ignorance or student hatred of chairs, but what is evident is that the war is an unjust assault on the school’s most ‘supportive’ seating ordinances. 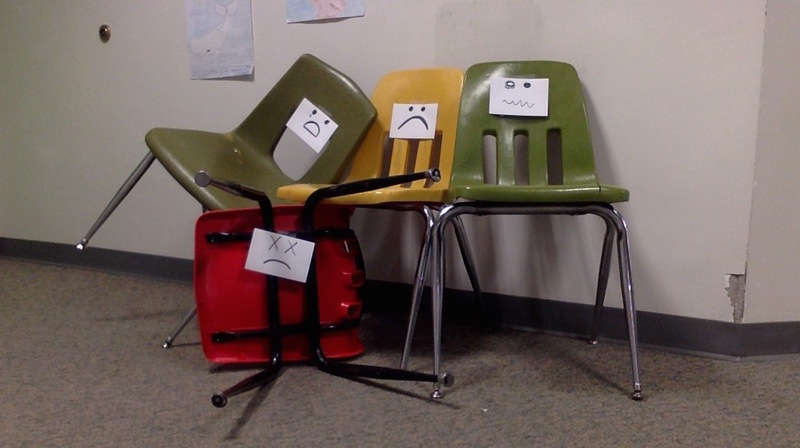 Many students use particular tactics to further the deterioration of the classroom chairs; these tactics include the act of leaning backwards in the chair (and then promptly crashing back down), the act of violently stacking the chair, and the act of twisting the chair when stretching. Each action targets the specific weaknesses of the chairs; classroom chairs, perhaps in error, are not built for the purposes of combat. The metal frame of each chair is susceptible to bending when under the immense weight of the average ‘heavyset’ high-schooler. The rotating feet of the chair are able to be detached; indeed, the most common chair injury is a limp. Finally, the flexible plastic backing of the chair loses its rigidity over time as students continually twist it in different directions. As a result of the students’ actions, the classrooms of Bonny Eagle High School are filled with chairs that are shells of their former selves. Many students seemingly fail to realize that, when they destroy their own classroom chair, they will be stuck with it for the rest of the trimester. Some resort to the unthinkable war-crime of trading a dead or wounded chair to another classmate − there really is no acceptable excuse for chair-cropping! The process for evacuating wounded chairs has recently been streamlined; teachers, serving as peacemakers, put these victims in the hallway for pickup and disposal. The need for this system highlights the acts of violence commonplace in classrooms. A group of classroom chairs rest outside Mr. Clark's classroom, awaiting disposal. Argument has arisen as to whether or not these chairs are actually headed to a better place; rumor has it many go on to be crushed by machines rather than students. 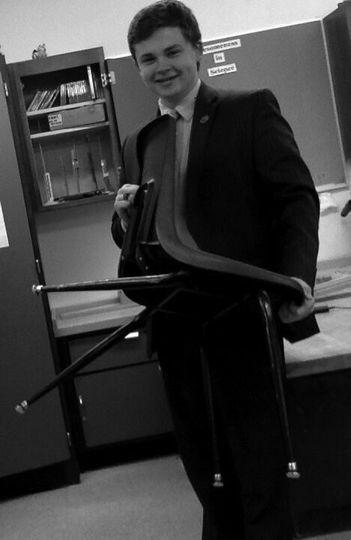 A recent turn of events in the war has some students questioning what the chairs have done to deserve this torture. While some seat-supremacists have claimed that the average classroom chair has forfeited its right to respect and fair treatment just by being a classroom chair, any objective analysis reveals the absurdity in this claim. Other than being susceptible to abuse, the classroom chair is extremely well-designed for its purpose; it is easily and cheaply manufactured, transported, and moved around in the classroom. In some instances the chairs are able to be repaired, though it has been made clear that the district’s policy has been to dispose of, and not mend, wounded warriors. These flat-bottomed chairs are easily used as stepping-stools to retrieve objects stuck upon the tops of cabinets, bookcases, or shelves. Rather than being inferior, these classroom chairs are superior for handling the purposes for which they were designed. Bailey Sawyer, the president of the junior class, also appears to be leading the crusade against the chairs. Since sixth grade, he has claimed to have had consistent “bad luck” with classroom chairs in general. Last year he destroyed three, and even managed to kill a chair during one of his 6th-grade performances. ​According to MSAD-6 Superintendent Frank Sherburne, the price of each replacement chair is $86.00.